Douglas L. Smith brings a breadth of knowledge and experience from the public and private sectors to the role of City Manager. Mr. Smith’s public sector experience includes serving as Deputy City Manager in the cities of Virginia Beach and Portsmouth. Additional leadership roles in Portsmouth included Chief Plans and Policy Officer and Economic Development Director. Smith was elected to the Portsmouth City Council in 2006, where he gained regional experience as commissioner for the Hampton Roads Transportation Planning Organization and the Hampton Roads Planning District. Previous private sector work included serving as president & CEO of Kaufman & Canoles Consulting, where he counseled national and local developers, municipalities, higher education institutions and corporations. 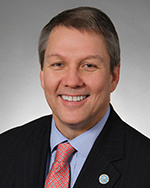 Smith began his career in 1985 as a banker at First Union Corporation where he was promoted to Vice President. Smith is a graduate of Norfolk Academy and earned a BA in History from the University of Virginia. He and his wife Linda reside in Norfolk with their two children. Click here for weekly City Manager updates.